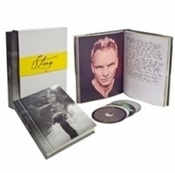 Sting's three-CD box set offers an intriguing portrait of the artist in his quarter-century quest to marry the many flavors of music. Bundling his early and later work together presents an excellent chance to really get a clear reading of how he has tweaked pop music and expanded its core. His early solo compositions after leaving the Police veered largely toward jazz and world beats, and his first CD, "The Dream of the Blue Turtles" featured an impressive roster of jazz players: Branford Marsalis, Kenny Kirkland, Omar Hakim and Darryl Jones. "If You Love Somebody Set Them Free" from that seminal 1985 album showcases Sting's flirtations for both jazz and rhythm and blues, while he revives the reggae that also influenced the Police in "Love Is the Seventh Wave," with its infectious refrain: "There is a deeper wave than this, rising in the land/There is a deeper wave than this, listen to me, girl." World beats and jazz, of course, are offered up again and again over the years - "Desert Rose," for example, from 1999's "Brand New Day," where Sting's vocals with Cheb Mami, share Middle Eastern inflections. "I Was Brought to My Senses," from 1996's "Mercury Falling," reflects just a taste of the Scottish Highland in its opening before floating to smooth jazz riffs. Sting's musical explorations became even more interesting in 2003 with his "Sacred Love" album where Bach influenced "Whenever I Say Your Name," a song that had Mary J. Blige on vocals. And there are tunes from his recent works, "Symphonicities," from 2010 and "If on a Winter's Night..."
The boxed set comes with a nicely packaged book of writings and photos, and a DVD, and lyrics to each tune. Sting is an intelligent lyricist, which for some fans can be a turn-off. But like it or not, Sting's very complexities elevate his music, from the peppiness of "Brand New Day" to the edgy narrative "I Hung My Head" to the sweetness of "When We Dance." Sting has truly given the gift of music.